Waldemar-H. “Waldi” Radener was born on 24 January 1921 at Lüchtrigen in the Weser region of Westfalen. 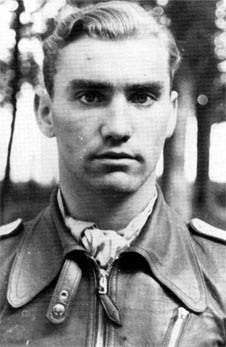 Leutnant Radener joined JG 26 in February 1943 following completion of his flying training. He was assigned to 4./JG 26. Radener shot down a RAF Spitfire fighter on 3 May to record his first victory. On 30 July he downed two USAAF P-47 fighters near Arnhem for his 4th and 5th victories. Radener was appointed Staffelkapitän of 6./JG 26 on 18 August, replacing Hauptmann Johannes “Hans” Naumann (34 victories, RK) who was taking command of II./JG 26. On 11 September, Radener was relieved of his command when Naumann was given command of 6./JG 26 to allow Major Johannes Seifert to take over II./JG 26. Radener assumed his previous position of second in command to Naumann. Pilots of 4./JG 26 in mid-1942. From left: Ofw. 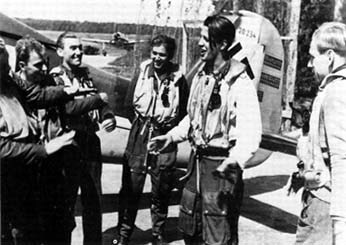 Willi Roth (20 victories, DK-G) , Lt. Ernst Janda (2 v.), Fhr. Waldemar-H. Radener, Uffz. Gerhard Birke (5 v.), Hptm. Kurt Ebersberger (30 v. DK-G) and Fw. Adolf Glunz (72 v. RK-EL). Radener shot down a P-47 on 11 January 1944 to record his 10th victory.  He was awarded the Deutsches Kreuz in Gold for 16 victories on 16 April. On 11 May, Radener brought down a USAAF B-24 four-engined bomber but then accidently rammed a second in his Fw 190 A-8 (WNr 680120) “Brown 2”. He baled out suffering only minor injuries. Radener was shot down on by USAAF P-51 fighters on 15 June in Fw 190 A-8 (WNr 730934) “Brown 2”. He baled out, but his parachute became caught up on his aircraft. He managed to free it but suffered injuries on landing serious enough to keep him out of combat until the end of the month. On 9 September 1944, Oberleutnant Radener was re-appointed Staffelkapitän of 7./JG 26. By the end of December he had 23 victories to his credit. Radener was appointed Gruppenkommandeur of II./JG 26 on 30 January 1945, replacing Major Anton Hackl (192 victories, RK-S) who had been appointed appointed Kommodore of JG 300. On 22 February 1945, Anton Hackl requested Radener transfer to JG 300 to command II./JG 300. Radener was awarded the Ritterkreuz on 12 March 1945. Radener survived the war. He joined the Bundesluftwaffe but was killed in a flying accident on 8 January 1957 near Schöngau. “Waldi” Radener was credited with 37 victories. He also recorded a further 14 unconfirmed victories. All his victories were recorded over the Western front, including 12 four-engined bombers with an additional six unconfirmed.